Good morning lovelies! And how was your weekend? Despite being the first of Autumn, here in NZ, ours still felt decidedly summery with warm sunny days, clear blue skies and the trees still lush with leaves….it’s a lovely time of year! I realise that whilst I am shivering at the thought of the shorter days and bare trees of Fall, many of you are looking forward to Spring after a long cold Winter. So, I decided this week’s wedding inspiration board should be just perfect for either season….. Inspired by that stunning Woodland elopement from Dylan and Sara Photography and the beautiful words from Alfred Lord Tennyson, today’s board is brimming with botanical infused beauty. Elegant and chic, the colour palette is simple – it’s all about the lush greens of Spring and the deep rich browns of Autumn, with a contrast of ivory, complimented by splashes of silver and a stone grey. This wedding colour palette would perfectly suit an outdoor celebration: a garden, winery or woodland; but if it’s too chilly then consider a venue with an orangery, greenhouse, covered courtyard or conservatory. A venue with an abundance of greenery will enable you to save on floral design – have a greenery table runner instead of centrepieces, and add height as well as opulence with grand candelabras. 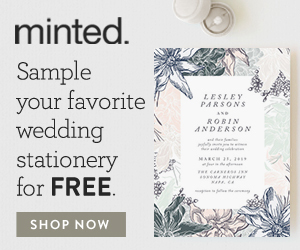 Flower festooned stationery will set the tone of your botanical affair and continue the theme with an ivory wedding cake adorned with greenery. Just the right side of masculine to still be pretty, this is a colour palette and theme your groom & groomsmen will love just as much as you do! Especially as it gives them a wide choice when it comes to their suit style, cut and colour – a black tuxedo for a formal wedding day look, a clean cut grey suit for slightly more relaxed yet elegant look, or add a touch of rustic charm with a brown tweed, but keep it suave with a 3 piece suit. I love this colour palette, don’t you? For more wedding inspiration boards featuring shades of gorgeous green take a look at this romantic Spring celebration or this Autumn beauty; or for other colour palettes perfect for a vintage wedding, whatever the season, simply click here, here and here.